In Figure 27.1B, observer S′ measures the velocity of the light ray emitted and propagating in system S′ by the hands of the respective synchronized clocks in system S′ to be ½t′0 – t′2 = c. According to Einstein’s Special Theory, this is a “proper” measurement because the light source and the reflecting mirror are relatively stationary, and the observer S′ makes such measurement of time with only one clock. On the other hand, observer S must measure the velocity of the light ray emitted in S′ by coordinates and algebraically as c – v. When the light ray in S′ is propagating in the opposite direction observer S′ measures the velocity of such light ray propagating in S by coordinates and algebraically as c + v. Both c – v and c + v are “non-proper” measurements. The only real differences between the measurements by S and by S′ are that S′ has a much simpler measurement. S must factor in the relative velocity v between the two frames, the changing number of coordinates that must be counted due to the displacement of the mirror in the S′ system from the observer in the S system, and the direction of the light ray propagating in S′. “Proper” measurements are irrelevant. The result ½t′0 + t′2 = c is only valid if the system, the mirrors, the observer S′ doing the measuring and the synchronized clocks are all relatively stationary. (Figure 27.1B) This result is the same as the empirical result of the Michelson & Morley experiment. However, if the reflecting mirror is displacing from the measurer S (Figure 27.1C), the velocity of light and ½t′0 – t′2 will be measured by S to be c – v or c + v, depending upon the relative direction of propagation and the displacing mirror’s motion v.
However, in order to artificially create the M & M paradox, Einstein measured such propagating light ray in system S′ from relatively stationary system S, which played the part of stationary ether. (Figure 27.1A) This artificial measurement resulted in mirror M2 displacing from the observer in S at v1. Quite naturally the observer in S would theoretically measure the light ray emitted in S′ to be c – v (a greater distance/time interval of propagation in the direction of motion v1), and c + v in the opposite direction (a shorter distance/time interval of propagation relative to S moving at v2). Taken together, Figure 27.1A and Figure 27.1B result in Figure 27.1C and Figure 9.2 (which both depict the M & M paradox). 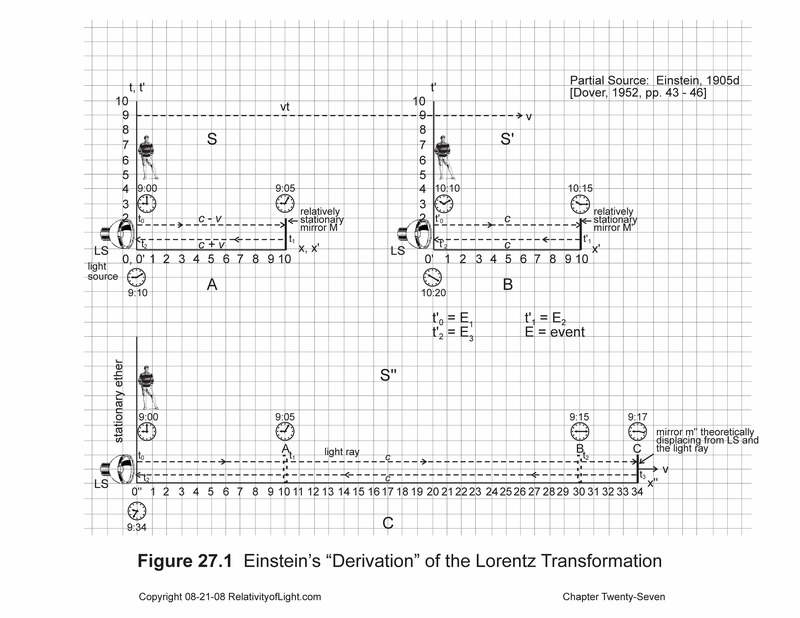 In Figure 27.1C the light ray is emitted at t0 from LS3 toward the displacing mirror M3 moving at v1. The light ray propagating at c – v catches up to mirror M3 at t2 and reflects back at c + v toward LS3 moving at v2, and it contacts LS3 at t0. This scenario produces a theoretically greater distance of light propagation and (when compared with Figure 27.1B) a missing time interval.